Arthroscopy has also greatly expanded orthopedic surgeon's understanding of problems around the joints. In many cases, conditions which were completely unknown before the invention of the arthroscope have been discovered and are now being treated very effectively with arthroscopic surgery. Very complex surgical procedures are now done inside the knee with the aid of the arthroscope. For example, the anterior and posterior cruciate ligaments inside the knee are now almost always reconstructed without opening the knee joint. The procedure is done by using the arthroscope to help see where to drill holes in the bone and to place the ligament graft. Even fractures that involve the joint surface of the lower leg bone (the tibia) are being fixed by watching the fracture through the arthroscope while screws are inserted through small incisions in the skin--a procedure that once required a large incision into the joint. There are many different types of anesthesia that can be done, depending on your wishes, your doctor's recommendations, and, of course, which joint is involved. In general, anesthesia may be local, regional, or general. Each of these types of anesthesia has advantages and disadvantages, but all are quite safe. Regional anesthesia is probably the most common type used for arthroscopy. It is often referred to as a block (for example, a spinal block). The block is done by injecting lidocaine around the nerves that go to an extremity (in a spinal block, these are the nerves that go to the legs). The advantages to this type of anesthesia are that it does not affect the function of the lungs (a concern if you have lung problems). It does not cause as much nausea as general anesthesia, and it is relatively safer than general anesthesia. You are also awake and can watch the procedure on the TV monitor. The disadvantages are that it takes longer to take affect than going to sleep, and the actual block involves an injection--which may be uncomfortable for a short period of time. General anesthesia is commonly referred to as going to sleep. It is commonly used for arthroscopic procedures--especially procedures which may be long and complicated. The advantages of general anesthesia are that you are not aware of anything that occurs during surgery. The disadvantages are that you may have a hangover with nausea and vomiting due to the drugs used, and you may have a higher risk of lung problems after surgery. Once the surgery is under way, various instruments are used to perform the procedure. The camera is used to view the inside of the joint while the other instruments are used to either remove or repair the problem. If you are awake, you can watch the TV monitor and see exactly what your doctor is seeing. 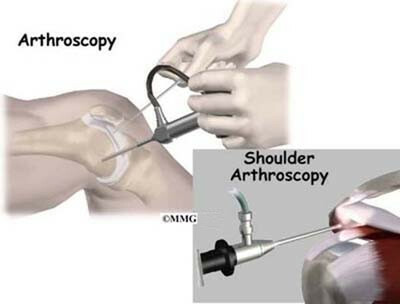 Still pictures or video can be taken through the arthroscope to record the condition of the joint. Your doctor performs the procedure while watching the TV monitor and guiding the instruments by what he or she sees on the TV. That's why arthroscopy is like a very sophisticated video game. Once you are ready to be released from the recovery room, you will probably return to where you started--the outpatient surgery department. Here you can wait with your family or friends until you are ready to be released to go home. You can probably have something to eat at this point and prepare to go home. You will be given some instructions at this point about what you should expect and what you should, and should not, be doing at home. In general, arthroscopy requires anesthesia, and there are risks associated with anesthesia. Different types of drugs are given during the procedure that may cause a reaction--even death in very rare instances.